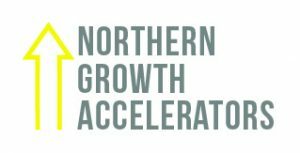 The latest in our Northern Growth Accelerator series of interviews, in partnership with EY, profiling exciting, fast-growth businesses from across the North. Leeds-based Sweet Squared is the distributor, marketer and educator of premium professional beauty products direct to the beauty industry. Founded by Samuel and Samantha Sweet, the business began trading from the couple’s garage in 2006. It went from a £12,000 loss when it first began operating to reporting a £2m turnover after year one. For the financial year to March 31 2017, Sweet Squared reported a turnover of £16m and pre-tax profits of £3.6m. 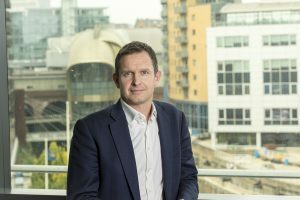 In the current financial year, the group is on target to achieve £17m turnover. Last month, Sweet Squared completed the acquisition of hairdressing business ICON Consultancy, based in Nelson, Lancashire, for a six-figure sum. Sweet Squared is hoping to achieve a turnover of over £24m in the coming year; and that all seems within sight given that just two weeks ago it launched its very own waxing brand. 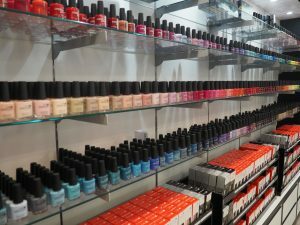 Samuel and Samantha at that stage brought Jim Nordstrom on board as a director, who had set up the well-known nail brand CND in 1979, which had been sold to Revlon in readiness for Nordstrom to retire. But he was very happy to come back into the marketplace working alongside Samuel and Samantha. Samuel had previously worked as a CND education ambassador, travelling across the globe educating professionals after starting his career in the nail industry aged 21. Four months later, he moved to Leeds and the pair married in January 1999. Samantha’s family were importing and distributing nail products for the professionals at that point and Samuel began to run seminars. have always focused upon having strong connections with professional beauticians; and those buying Sweet Squared products have to show proof of their qualifications before purchasing in order to ensure the highest of standards. They have been approached to supply consumers directly on numerous occasions but have never looked to change their business model in this way. Samantha said: “Because of our background in the industry, we have always known the customers. We are great believers that we should do something for the right reasons and if you do that, everything else follows. The pair introduced a line of nail stickers called Minx in 2009, which celebrities including Beyoncé and Lady Gaga began wearing – sending order numbers “nuts” due to the popularity of the product. Samantha said the product also appealed to people who wanted short-term nail art which had maximum effect for a specific occasion. During the London Olympics in 2012, Sweet Squared provided nail stickers of flags for every single competing country for the athletes; which did huge amounts for brand awareness. And as the UK distributor, Sweet Squared could deliver the product quickly to meet demand. 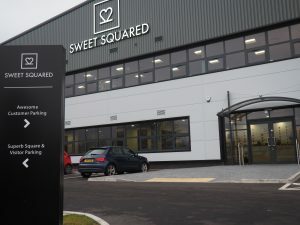 Sweet Squared moved to premises in West Park in 2007, and had a separate warehouse near Pudsey. At that time, the firm had ten employees and so sub-let half of the West Park building as they didn’t need all of the space. 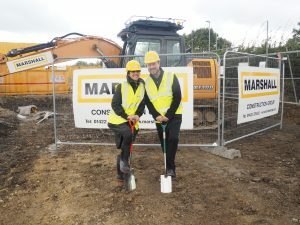 As they began growing, Samantha and Samuel started to look for space to house both the offices and the warehouse on one site. They wanted to remain in Leeds and bought a plot of land off Coal Road, moving into their new premises, with 10,000 sq ft of office and education space and 20,000 sq ft of warehouse “Squarehouse” space, in September 2017. Their priority has been to ensure a swift and positive transition for their now 100-strong workforce. In this regard, for the first nine months at the new site, employees will receive fuel allowance. This is no small challenge, given that Sweet Squared promise a next day service to their customers. Last year, they completed 116,139 orders which consisted of distributing 1.5m items. This has been achieved by heavy investment in technological systems that allow the company to deliver a high volume of orders accurately, with tracking facilities through a courier. “Ensuing that we maintain our brand and our identity is incredibly important to us. Our brand is our culture and our connectivity. We can and want to stay engaged with the customer base,” added Samuel. Each growth and investment is completed in-house too, because the pair are intent on putting their own money into the business. 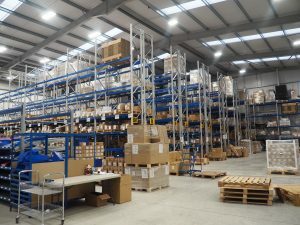 This includes purchasing the site where their warehouse is located without external financing. Samuel said: “Because we wholeheartedly believe in it, we out our own money in. We are not debt driven. Sometimes it is important to know what you don’t want in a business and debt can be a good tool. The business has survived the tough times because the nail industry is “recession proof,” said Samantha. The pair explained that at a low price point, people can have their nails done as a low-cost way of maintaining appearance and feeling good. “It’s instant gratification,” she added. Sweet Squared has a team of 50 education ambassadors, who work on a contracted basis to deliver sessions across the UK and Ireland. 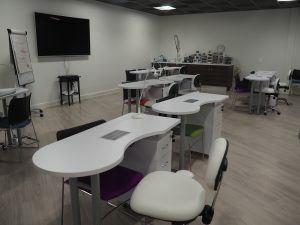 Their new Leeds premises – which have been designed from the outset by Samuel and Samantha – has suites for training, including a nail salon. So what else does the future hold for this growing firm? “Such a lot of people bring value to this business and as long as we are still coming in and enjoying what we are doing, we are very happy,” added Samantha. Love and respect, The Human League, The Full Monty… very rarely does a meeting I go to include such a variety of subject matters. Well it does when you meet Samuel and Samantha Sweet of Sweet Squared. Sitting proudly in their new purpose built facility in Leeds, the founders of Sweet Squared are incredibly passionate about the business they founded in their garage 12 years ago, and rightly so. Sweet Squared supplies branded beauty products to professionals and, with the training it runs through its education centres, it is able to cement the relationship with the salon owners and beauticians who are its customers, building both trust and brand equity. This acute focus on meeting customer needs with the brand purpose to “honour and serve the pro – with love & respect!” is a clear driver of success and it underpins the stellar growth the business has experienced. Advances in technology, social media and the choice available mean the relationship with and loyalty of the customer is absolutely crucial to success and the Sweet team are all over it. Self-funded from day one, the Sweet team have a respect for virtues of strong financial control, discipline and they understand the value and importance of having a business mentor. They are clear on their global aspirations and desire to diversify their current range of products; in fact when we met the launch of their new ‘Wax One’ range was imminent and more will follow. Sweet Squared is a great Yorkshire success story and one I’m sure many others will aspire to follow.